Hunting Leases for Whitetail Deer, Mule Deer, Javelina, Hogs, Turkey, Pronghorn, Waterfowl, Upland Birds, Varmints and Exotics! If this is your first visit, click the “Hunting Leases” button on the menu bar (above). This will give you a “sneak peek” of the type of hunting lease information we provide. Once a member, you’ll find complete information including the landowner’s contact information. It’s important to note that you’ll be dealing directly with the landowner/advertiser. Additional tips and information can be found in the Blog and on our FAQ page. 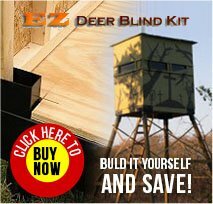 Also, please check out our EZ Deer Blind Kits. It enables the hunter to build and customize his own tower blind for a fraction of the cost of a prefab unit. Join today to access our directory of Texas Hunting Leases with your new membership. DeerTexas.com has serious and dedicated hunters who have already paid to find you. Please consider advertising your available hunting lease(s) now for FREE! Once you’ve submitted your ad you may edit or delete it at any time so your listing stays current. You can also upload pictures to your ad, again, for FREE! Join DeerTexas.com for 6 months. I guarantee that if you’re not satisfied with the service, I will refund the price of your subscription at the end of your term. You have absolutely nothing to lose. Please feel free to call or write anytime if you have any questions or comments. Thank you and good hunting!